The headline appears one afternoon on several news websites almost simultaneously: GOVERNOR PACKER ATTACKED! -- The Nix by Nathan Hill. I downloaded this audiobook from the library after seeing it so often on Instagram but knowing nothing about it. So far, I think it is hilarious. It sort of reminds me of The Goldfinch because it starts in the present day and then goes back in time to the story of two little boys, one in love with a beautiful girl. But it isn't dark and self-important like The Goldfinch. The satire is also razor sharp, not ham-fisted like most satire by debut authors. No way! I was nearly nearly going to share this one too - read it last weekend, and loved it. Hope you do too. I'm in the mood for something with a few laughs. I'll have to look for it. I am linking to the meme on my blog-- thanks for the great idea! The ratings and revews for this book have been totally amazing, so you really should enjoy it. I did cheat a little and check out the full premise and whilst it does sound good, humorous books are just not my thing, so I shall probably pass on adding it to my own list. Thanks for the feature though and the chance for me explore something new. 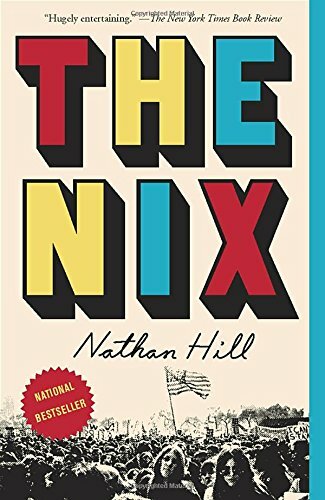 As an aside, if you do enjoy the read, then you might also like to know that 'The Nix' is being adapted for television, backed by Warner Brothers and starring Meryl Streep. Sounds interesting. I hope you'll enjoy it. Your Nathan Hill book sounds fun, it is so hard to get humour and satire right on the page. I have linked to my Book Beginnings blog - thanks for hosting this! This sounds really interesting and I'm glad the satire is on point, because when that goes wrong it goes wrong in a big way! Thanks for hosting and I hope you have an amazing weekend! This has been on my radar but not my TBR. I absolutely love your description of it - especially in comparison to The Goldfinch. I think that alone tells me I need to read The Nix. I haven't heard of this one before, but it sounds good. Funny is always welcome. Thanks for hosting. I have seen this book. I must say that the book sounds intriguing! I am currently reading 'The Girls in the Water'. It's really good! I have also had this on my to-read list simply because I saw it in lots of places. It must be good, right? I like the beginning and what you had to say about it. I'm off to check my library.